Apr 10, 2015 - TORRANCE, Calif. The all-new, third generation 2016 Honda Pilot will go on sale this summer ready to take the mid-size SUV segment by storm, with more of what active families seek in a three-row SUV – sleek and athletic styling, outstanding power, sophisticated technology and, new for 2016, an all-new Elite model with a panoramic roof and a vast array of other standard features. Building on the solid reputation established from the fall 2002 introduction of the first generation 2003 model, the 2016 Pilot brings a whole new level of refinement and available content to the segment. This includes a more powerful direct injected 3.5-liter SOHC i-VTEC® Earth Dreams™ Technology engine producing 280 horsepower1 and 262 lb-ft of torque2, and new 6-speed and 9-speed automatic transmissions. Providing outstanding dynamic handling are a new Intelligent Variable Torque Management™ (i-VTM4™) AWD System and all-new selectable Intelligent Traction Management system featuring Normal, Mud, Sand, and Snow modes on the AWD model and Normal and Snow on the 2WD model. Also significantly upgraded are the Display Audio and navigation systems. The available Honda Sensing™ suite of safety and driver assistive technologies brings available features that include Collision Mitigation Braking System™3 with Forward Collision Warning4, Road Departure Mitigation System5, Lane Keeping Assist System6 with Lane Departure Warning7 and Adaptive Cruise Control8. Providing customers with a greatly increased range of trim levels, the 2016 Pilot is available in a new top-of-the-line Elite trim together with LX, EX, EX with Honda Sensing™, EX-L, EX-L with Honda Sensing™ and Touring trims. Honda Sensing™ is standard on both Touring and Elite trims. The Pilot Elite offers an extensive feature content list, including a panoramic glass roof, heated and ventilated front seats, second-row heated captain's chairs, LED headlights with auto high-beam, rain sensing windshield wipers and much more. And these are in addition to a long list of standard features throughout the Pilot trim range. 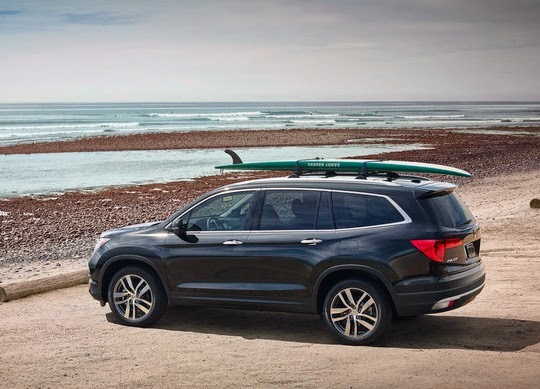 The 2016 Pilot delivers more refined, powerful and fuel-efficient performance than ever before courtesy of its new 3.5-liter, direct-injected i-VTEC® V-6 engine with Variable Cylinder Management™ (VCM™) cylinder deactivation technology. The engine's peak output of 280 horsepower and 262 lb.-ft. of torque is up 30 hp and 9 lb.-ft. over the previous model. The engine is matched to a choice of two new advanced transmissions – a Pilot-first 6-speed automatic transmission or, on upper trims, a Honda-first 9-speed automatic transmission – both delivering more refined, responsive and fuel-efficient performance. The Pilot's available new Intelligent VTM4 (i-VTM4) is the most sophisticated and technologically advanced all-wheel-drive system offered in a mainstream, three-row SUV. This entirely more capable system progressively distributes optimum torque between the front and rear axles and, for the first time ever in a Honda vehicle, dynamically distributes engine torque between the left and right rear wheels using the new, lightweight rear drive unit. Benefits include superior all-weather handling and neutral, accurate steering under power that is unmatched by front-drive, rear-drive or conventional all-wheel-drive systems. This new Pilot features a new button-operated Intelligent Traction Management System that offers different operating modes, for the AWD: Normal, Mud, Sand and Snow; and for the FWD: Normal and Snow. Reflecting Pilot's role as a key U.S. export model, this system was developed, tuned and tested at various locations in the U.S. and around the world – including in Imperial Dunes “Glamis”, California; Moscow, Russia; and Dubai, United Arab Emirates. The Intelligent Traction Management system allows the driver to select the operating mode that best suits the driving conditions by simply pushing a button on the vehicle's center console. Based on the setting selected, the system adjusts the drive-by wire map, transmission shift map, Vehicle Stability Assist™ and i-VTM4 torque distribution for AWD equipped models for optimal performance in varying road or surface conditions. Honda's latest thinking for advanced, family-friendly technology is embodied in the new Pilot. New features include the available 8-inch capacitive touchscreen Display Audio telematics interface with Android operating system and all-new Honda Satellite-Linked Navigation System™ developed in cooperation with the experts at Garmin®24. The exterior colors are keyed to the 2016 Pilot's three new available interior colors: Black, Gray, Beige." 3 CMBS cannot detect all objects ahead and may not detect a given object; accuracy will vary based on weather, speed and other factors. System operation affected by extreme interior heat. System designed to mitigate crash forces. Driver remains responsible for safely operating vehicle and avoiding collisions. 5 Road Departure Mitigation only alerts drivers when lane drift is detected without a turn signal in use and can apply mild steering torque and/or brake pressure to slow the vehicle's departure from a detected lane. Road Departure Mitigation may not detect all lane markings or lane departures; accuracy will vary based on weather, speed and road condition. System operation affected by extreme interior heat. Driver remains responsible for safely operating vehicle and avoiding collisions. 6 LKAS only alerts drivers when lane drift is detected without a turn signal in use and can apply mild steering torque to assist driver in maintaining proper lane position. LKAS may not detect all lane markings or lane departures; accuracy will vary based on weather, speed and road condition. System operation affected by extreme interior heat. Driver remains responsible for safely operating vehicle and avoiding collisions. 8 ACC cannot detect all objects ahead and may not detect a given object; accuracy will vary based on weather, speed and other factors. ACC should not be used in heavy traffic, poor weather or on winding roads. The driver remains responsible to slow or stop the vehicle to avoid a collision. 9 Always visually confirm that it is safe to drive before backing up; the rearview camera display does not provide complete information about all conditions and objects at the rear of your vehicle. 10 For optimal tire wear and performance, tire pressure should be checked regularly with a gauge. Do not rely solely on the monitor system. Please see your Honda dealer for details. 12 Windows Media® is a trademark or registered trademark of Microsoft Corporation in the United States and/or other countries. 15 The USB Audio Interface is used for direct connection to and control of some current digital audio players and other USB devices that contain MP3, WMA or AAC music files. Some USB devices with security software and digital rights-protected files may not work. Check the HondaLink® website for smartphone compatibility. Please see your Honda dealer for details. 16 Check the HondaLink® website for smartphone compatibility. 17 Compatible with select phones with Bluetooth®. Your wireless carrier's rate plans apply. State or local laws may limit use of texting feature. Only use texting feature when conditions allow you to do so safely. 18 SiriusXM services require a subscription after any trial period. If you decide to continue your SiriusXM service at the end of your trial subscription, the plan you choose will automatically renew and bill at then-current rates until you call SiriusXM at 1-866-635-2349 to cancel. See our Customer Agreement for complete terms at www.siriusxm.com. Fees and programming subject to change. XM satellite service is available only to those at least 18 years and older in the 48 contiguous United States and D.C. ©2015 Sirius XMRadio Inc. Sirius, XM and all related marks and logos are trademarks of SiriusXM Radio Inc.
19 Pandora, the Pandora logo, and the Pandora trade dress are trademarks or registered trademarks of Pandora Media, Inc. Used with permission. Compatible with select smartphones. See: www.pandora.com/everywhere/mobile. Not all devices compatible with USB connection. Your wireless carrier's rate plans apply. 20 HDMI, the HDMI Logo, and High-Definition Multimedia Interface are trademarks or registered trademarks of HDMI Licensing, LLC, in the United States and other countries. 21 The Honda Satellite-Linked Navigation System™ is available on EX-L models and standard on Touring and Elite models in the United States, Canada and Puerto Rico. (Honda HD Digital Traffic service only available in the United States, except Alaska). Please see your Honda dealer for details. 22 The system is not a substitute for your own visual assessment before changing lanes; system accuracy will vary based on weather, size of object and speed. 24 The Honda Satellite-Linked Navigation System™ is available on EX-L models in the United States, Canada and Puerto Rico. (Honda HD Digital Traffic service only available in the United States, except Alaska).